The Conjuring (2013) was somewhat of a rarity because it was a modern-day horror movie (set in the 1970s) that was actually scary. So often these days, horror movies seem intent upon generating shocks rather than scares, and they seldom get under our skin by inducing pure fear, but The Conjuring proved frightening and lived up to its label. It was also a bona fide box-office hit, and that means a sequel was inevitable. 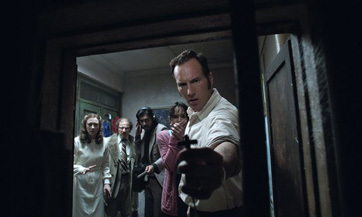 With The Conjuring 2, director James Wan, who also helmed the first film, is again able to invoke some chilling scenes and the movie has a mostly intelligent screenplay, but overall it falls short of being satisfying to the point of being recommendable. Compared to most recent horror fare, it's on the higher quality side, but given how notoriously weak the genre is, that's not necessarily saying much. I did leave it hoping there would be another entry in the series because the characters and their situations are intriguing and have the potential to really shake us, and while this one does, it's not to the degree we hoped. Like the original, this is another “true story” based on a case file of Ed and Lorraine Warren (Patrick Wilson and Vera Farmiga), the husband-wife team of paranormal investigators and authors who specialize in uncovering the mysteries behind disturbing, inexplicable phenomena, which often involves the macabre and supernatural. In the first film, they helped a family cursed by an evil spirit in Rhode Island; this time around, they journey across the Atlantic to Enfield, a small, working-class borough of London. The church in Enfield has reached out to the Warrens because a local family, the Hodgsons, are the latest victims of a malevolent presence - the soul of an old, sinister man - that possesses the youngest daughter, Janet (Madison Wolfe).